A chord progression where the dominant chord is the final chord of the cadence and is preceded by the tonic chord in second inversion (6/4-V). It should be noted that this pattern produces two chords with the same bass note in both chords. The "I" represents the chord based on the first step of the scale (with the 6/4 indicating second inversion) and the "V" represents the chord based on the fifth step of the scale. 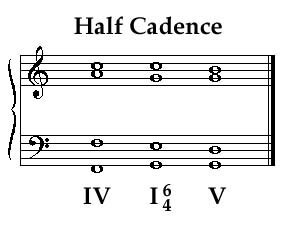 In the tonality of "C" major, a half cadence would be the tonic in second inversion (I 6/4) C major chord (G C E) moving to the dominant (V) G major chord (G B D). See more about cadences in the Appendix.